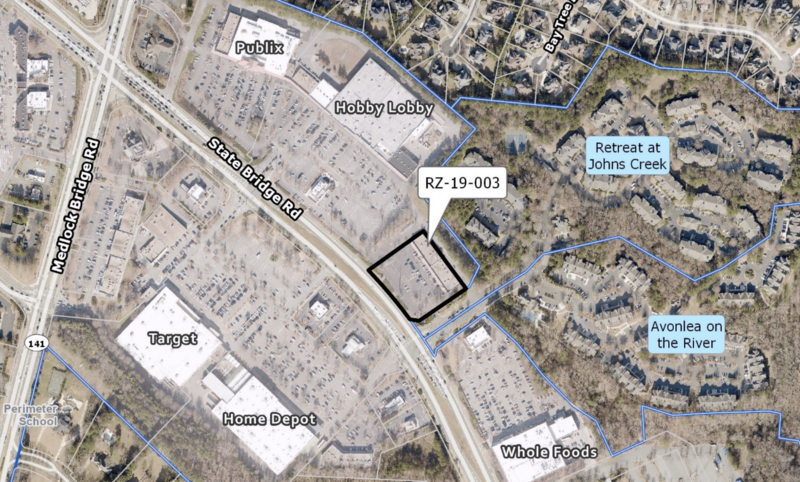 Because driving around Johns Creek isn’t difficult enough, Race Trac Seeks Rezoning for a proposed gas station on State Bridge Rd is set to be an arduous task. Situated currently where the Sherman Williams paint store is, near Whole Foods is the proposed location. The main entrance is in the rear of the parcel, behind the property. To access, you’ll drive down the road, Camden Way as if your going to Whole Foods. Go straight, to the stop sign. From here you’ll have to contend with oncoming traffic from two apartment complexes and traffic from your right from Whole Foods grocery store. Make a left and then another left past 19 parking spots. Make a right it’s a short left to where you pull into the gas pump stalls. 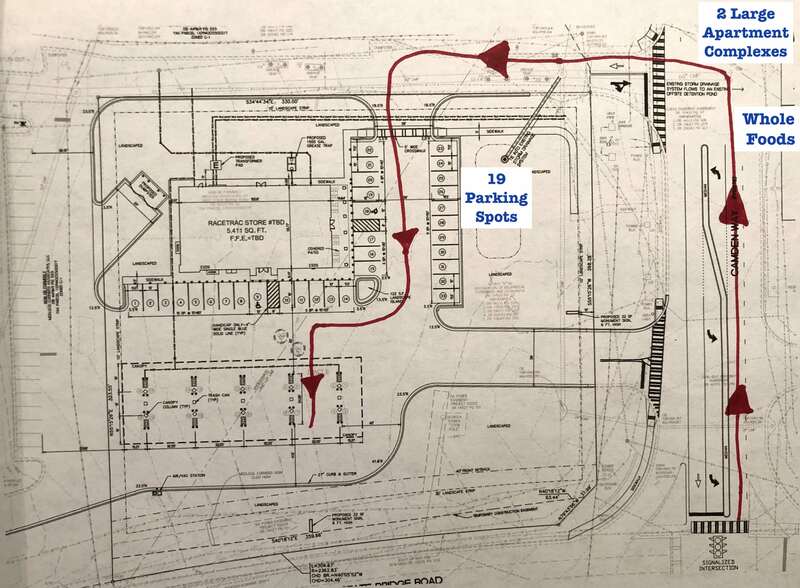 And if you have to get back out onto State Bridge Road you pull out into a short right turn lane merging if you have to make a left onto State Bridge and go east you’ll have to cross over three of lanes of stacked traffic from the apartment complexes and Whole Foods. Easy peasy and more common sense than having access on and off of State Bridge Rd – right?! We have not heard back from city hall, despite 2 emails. 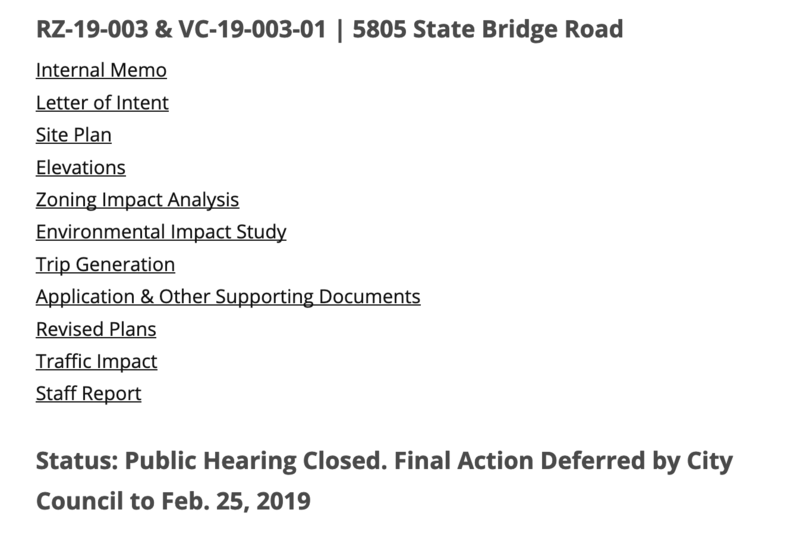 It is on the agenda and also on the City website for Feb 25th. Race Trac tried to get a permit for Old Atlanta Rd and McGinnis and the neighborhoods shut it down. No. More. Development of any kind! Our lovely area will soon be unrecognizable. There isn’t a decent gas station anywhere near that intersection and one is badly needed so why not? 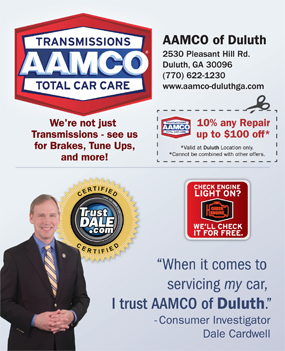 Why should JC residents have to drive to Duluth (proper) to get gas? Instead of trying to block this one, why not direct your attention and energy to the BP/Kikos stations instead. All of those locations have massive flood lights that shine OUT instead of down and have insides the are so dirty that they should not even have a food permit. Note: the locations I’m referring to are: State Bridge & Jones Bridge + 141/Medlock & Abbots Bridge + the one on Jones near Newtown Park). There is a BP 1/4 mile up on the same side of the road. If there are concerns at the other locations, let code enforcement know about the lighting and health dept know about the cleanliness issues. 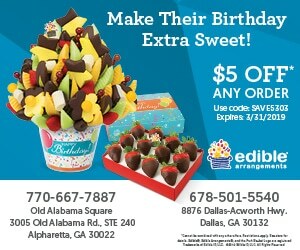 Traffic and accidents are bad enough here and now you want to add a Racetrac that’s stays open 24 hours! This should NOT be allowed under no circumstances. Given our community is continuing its slide to decadence, why don’t we throw in another liquor store and massage parlor with the gas station Mayor….